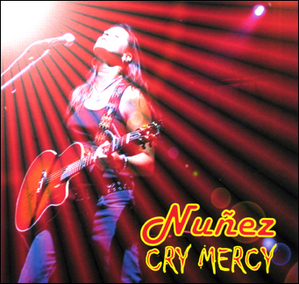 Linda Nuñez brings chic to chick rock, mixing it up in a dynamic style that incorporates elements of latin fire into the hammer-down rock as well as flaunting a flair for sweetly sensitive and lyrical balladry. Girlfriend's got a set of pipes that'll knock ya down; she knows how to belt 'em. Linda's website offers up some backstory, but to really know and appreciate this particular artist, you have to see her live in concert. Engaging, confidential and with a slick sense of humor, Linda always seems to get a natural rapport going with her audiences. While the music is flowing, she is pure energy; dancing, moving, grooving, playing off of the band. Never a dull moment. The band, Nuñez, serves as a powerful and effective support for this music with guitarist Chuck Dorris standing out as MVP of sizzle when it comes to rock 'n' roll pyro. In our Ear Bud Jukebox is the title track from the new album Cry Mercy.